We are proud to be hosting a FREE Parent & Community Information Night with founder of The Resilience Project, Hugh van Cuylenburg. In this not to be missed presentation, Hugh will share his experience of working in education for the past 13 years and show mindfulness and gratitude can help people stay mentally healthy. This free session is open to all parents, guardians and local community members and will help inspire students, empower teachers and engage parents. Safety Bay Senior High School Deputy Principal Clinton Wiltshire encouraged parents and community members to come along to the information session. 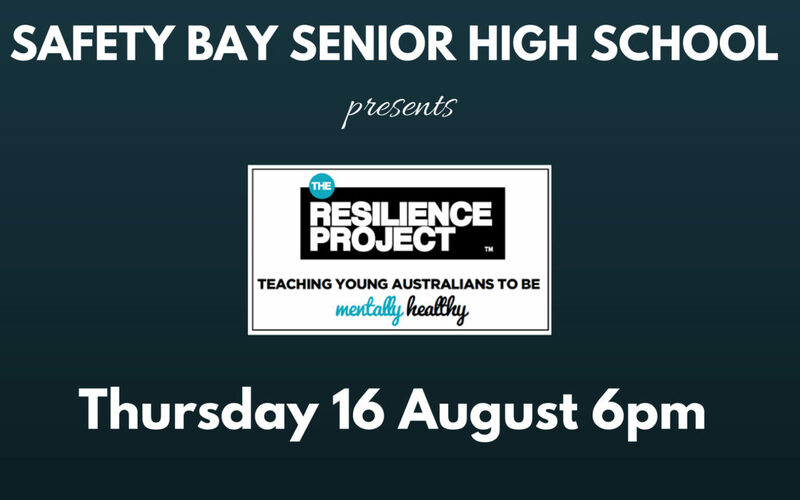 “I would strongly encourage all parents and community members to come along and hear from Hugh on how The Resilience Project can help you and your children stay mentally healthy. “With an increasing prevalence of mental illness in our society, it is more important than ever for parents and the community to work together tom support our young people. “It is equally important to look after yourself, and we know that practising mindfulness, empathy and gratitude daily can help with this,” Mr Wiltshire said. The Resilience Project conducts emotionally engaging programs in schools for students, parents, teachers and uses evidence-based approches to build resilience in order to develop positive mental health. Register: FREE event, reserve your place now!